Vice Admiral J. Mudimu was born on 6 March 1954 in Sophiatown (Johannesburg). He joined the African National Congress (ANC) and Umkhonto We Sizwe (MK) in 1975. A student leader in 1976, he left South Africa on 14 August 1976 for exile. He received his military training in Angola, East Germany and the then USSR. He successfully completed the commander’s course in 1977. He then served as an instructor in MK camps until 1979 when he was deployed as Chief of Logistics in Luanda, Angola. He later served in ANC Headquarters in Lusaka, Zambia as the co-ordinator of the ANC Youth Radio Programs as well as a member of the Editorial Board of the Youth Publications. Early in 1985, he was deployed in Harare, Zimbabwe as the ordnance operative. Later, he was deployed as a commander of the underground units in the Transvaal and Northern Transvaal Provinces. In 1992, he was appointed Deputy Chief of Personnel and Training and served in the MK High Command until the integration of the forces to form the South African National Defence Force in 1994. After the integration of the forces, he was appointed to General Siphiwe Nyanda’s office as MK Chief of Staff Personnel and Training. Later he was appointed Director, Integration of the Non Statutory Forces (NSF’s). On 12 January 1998, he was appointed into the South African Navy as a Rear Admiral (Junior Grade). Later, he was appointed as the Inspector General (Navy). That same year, he successfully completed the Navy Senior Command and Staff Course as well as the Senior Management Programme at the University of Stellenbosch. 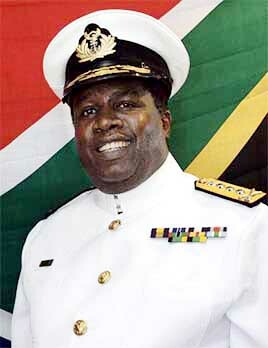 On 1 April 1999, he was transferred to Simon’s Town where he was appointed Chief of Fleet Staff until 30 September 2000. On 1 October 2000, he was promoted to the rank of Rear Admiral and appointed as Chief Director Maritime Support, the post description later changed to Chief of Naval Staff. He has successfully completed all military courses prescribed for senior officers since 1994. Vice Admiral Mudimu successfully completed the Joint Staff Course. On 1 March 2005, he was promoted to Vice Admiral and appointed as Chief of the South African Navy. Vice Admiral Mudimu holds a Masters Degree in Military Science and an Honours Degree in Public Management and Governance. He also holds an Associate Degree in Safety and Security, a Diploma in Human Resource Management and a Diploma in Personnel and Training, a Certificate in Journalism and other management qualifications.